Having scored 22 goals and given 32 assists in an impressive 178 appearances in just four years, it is clear that Turan has excelled under Diego Simeone during his very successful spell in the Spanish capital. The 28-year old attacking midfielder had been heavily linked with Premier League trio Arsenal, Chelsea and Manchester United but has left Atletico to join treble-winners Barca despite the fact he will be ineligible to play until January 2016 because of the club’s transfer ban. "It would be fantastic. 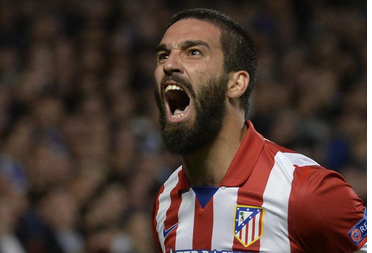 Arda makes everything so much easier out on the pitch,"
"Arda, Filipe Luis and I function perfectly. And Arda is such a great person. "He invited us to eat at his house many times, I really liked his kebab. The whole team would go round to his house for dinner." Regarding the Barcelona presidential elections, the Catalan club reserve the right to re-sell the player to Atletico until 20 July. A club statement read: “The agreement includes the option of selling the player to Atletico Madrid for the fixed fee less 10% option costs." "The commission included an unusual clause which means whoever wins the 20 July election has the option within two days of selling Turan back to Atlético less 10% of the fixed fee.